Atarpi.—Sin of the world.—Mother and daughter quarrel.—Zamu.—Punishment of world.—Hea.—Calls his sons.—Orders drought.—Famine.—Building.—Nusku.—Riddle of wise man.—Nature and universal presence of air.—Gods.—Sinuri.—Divining by fracture of reed.—Incantation.—Dream.—Tower of Babel.—Obscurity of legend.—Not noticed by Berosus.—Fragmentary tablet.—Destruction of Tower.—Dispersion.—Locality Babylon.—Birs Nimrud.—Babil.—Assyrian representations. from the generality of these inscriptions, being very obscure and difficult. In consequence of this and other reasons, I only give an outline of most of the story. 3. . . . shall not stretch until before he turns. 15. may favour be broken off, and good not be given. 25. favour was broken off, good was not given. famine from want of rain, but there are some obscure words even in this passage. Here the story is again lost, and where it recommences some one is making a speech, directing another person to cut something into portions, and place seven on each side, then to build brickwork round them. After this comes a single fragment, the connection of which with the former part is obscure. 1. I curse the goddess . . . .
2. to her face also . . . .
5. in the assembly of the great gods the will? 7. Anu has sent me . . . .
8. your king has sent? At present no satisfactory story can be made out of the detached fragments of this tablet, but it evidently belongs to the mythical portion of Babylonian history. The next text is a single fragment, K 2407, belonging to a curious story of a wise man who puts a riddle to the gods. 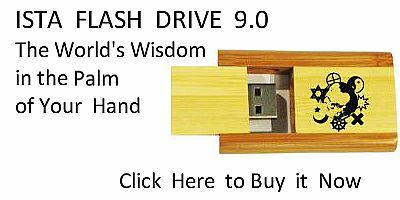 1. which in the house is . . . .
2. which in the secret place is . . . .
3. which is in the foundation of the house . . . .
4. which on the floor? of the house stands, which. . . .
5. which in the vicinity . . . .
6. which by the sides of the house goes down . . . .
7. which in the ditch of the house open, lays down. . . .
12. which into the breast of a man enters, which into the breast of a woman enters. After this there is a mutilated passage containing the names, titles, and actions of the gods who consider the riddle. It is evident that it is air or wind which the wise man means in his riddle, for this is everywhere, and in its sounds imitates the cries of animals. Next we have another single fragment about a person named Sinuri, who uses a divining rod to ascertain the meaning of a dream. 1. Sinuri with the cut reed pondered . . . .
6. has come, which thou knowest, but I do not know. 8. if it be evil may its evil not happen to me. no indication as to the story to which it belongs. 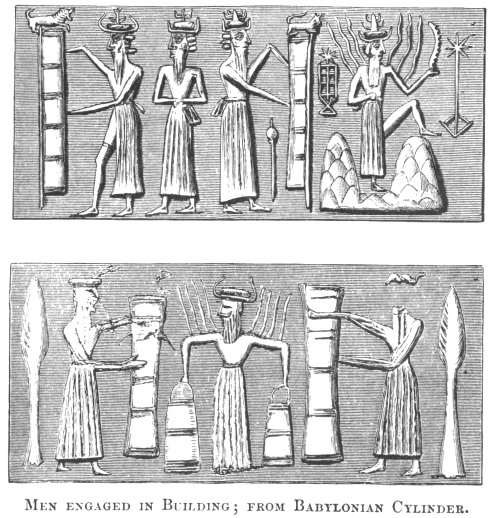 MEN ENGAGED IN BUILDING; FROM BABYLONIAN CYLINDER. [paragraph continues] Babel. So far as we can judge from the fragments of his copyists, there was no reference to it in the work of Berosus, and early writers had to quote from writers of more than doubtful authority in order to confirm it. near, in much the same attitude. There is no proper proportion between the supposed structure and the men, and I would not urge more than a possible connection with the myth. The utter absence of any allusion to the tower, either in Berosus or the inscriptions, led me to doubt at one time if the story. ever formed part of the Babylonian history. Early this year I was astonished to find, on having one of the Assyrian fragments cleaned, that it contained a mutilated account of part of the story of the tower. I have since searched through the whole collection, but have been unable to find any more of this tablet, except two minute fragments which add nothing to the text. It is evident from the wording of the fragment that it was preceded by at least one tablet, describing the sin of the people in building the tower. The fragment preserved belongs to a tablet containing from four to six columns of writing, of which fragments of four remain. The principal part is the beginning of Column I. 1. . . . . them? the father . . . .
6. [small] and great he confounded their speech. 8. [small] and great he confounded their speech. 11. entirely he made an end. There is a small fragment of Column II., but the connection with Column I. is not apparent. 1. Sar-tul-elli . . . .
2. in front carried Anu . . . .
3. to Bel-sara his father . . . .
4. like his heart also . . . .
5. which carried wisdom . . . .
6. In those days also . . . .
7. he carried him . . . .
8. Nin-kina . . . .
9. My son I rise and . . . .
10. his number(?) . . . .
11. entirely . . . . There is a third portion on the same tablet belonging to a column on the other side, either the third or the fifth. Reverse Column III. or V.
1. In . . . .
2. he blew and . . . .
3. for a long time in the cities . . . .
4. Nunanner went . . . .
5. He said, like heaven and earth . . .
6. that path they went . . . .
7. fiercely they approached to the presence . . . .
8. he saw them and the earth . . . .
9. of stopping not . . . .
10. of the gods . . . .
11. the gods looked . . . .
12. violence(?) . . . .
13. 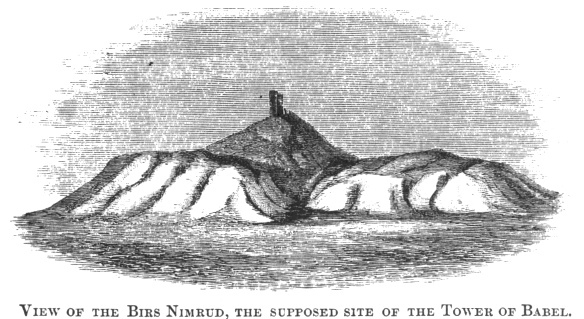 Bitterly they wept at Babi . . . .
14. very much they grieved . . . .
15. at their misfortune and . . . .
VIEW OF THE BIRS NIMRUD, THE SUPPOSED SITE OF THE TOWER OF BABEL. These fragments are so remarkable that it is most unfortunate we have not the remainder of the tablet. In the first part we have the anger of the gods at the sin of the world, the place mentioned being Babylon. The building or work is called tazimat or tazimtu, a word meaning strong, and there is a curious relation, lines 9 to 11, that what they built in the day the god destroyed in the night. The remainder of the fragment and the two fragments of the other columns agree with the story as far as their mutilated condition allows. The fractured end of the 13th line of the third fragment has the beginning of a name Babi, which may be completed Babil or Babel, but I have not ventured on the restoration. In the case of the 6th and 8th lines of the first fragment I have translated the word "speech" with a prejudice; I have never seen the Assyrian word with this meaning. 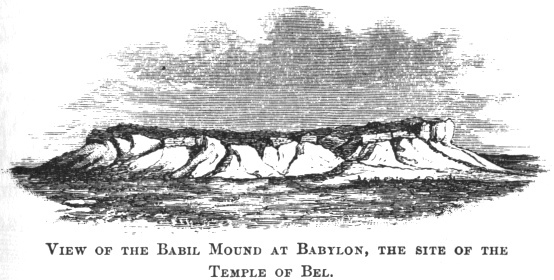 VIEW OF THE BABIL MOUND AT BABYLON, THE SITE OF THE TEMPLE OF BEL. TOWER IN STAGES, FROM AN ASSYRIAN BAS-RELIEF. have been devoted to the planet Saturn. The second stage was a square of 230 feet, 26 feet high, faced with orange-coloured bricks; supposed to be devoted to Jupiter. The third stage, 188 feet square, and 26 feet high, faced with red bricks, was probably dedicated to Mars. The fourth stage, 146 feet square, and 15 feet high, was probably devoted to the Sun, and is supposed by Sir H. Rawlinson to have been originally plated with gold. The fifth stage is supposed to have been 104, the sixth 62, and the seventh 20 feet square, but the top was too ruinous to decide these measurements. These stages were probably devoted to Venus, Mercury, and the Moon. Each stage of the building was not set in the centre of the stage on which it rested, but was placed 30 feet from the front, and 12 feet from the back. The ruin at present rises 154 feet above the level of the plain, and is the most imposing pile in the whole country. 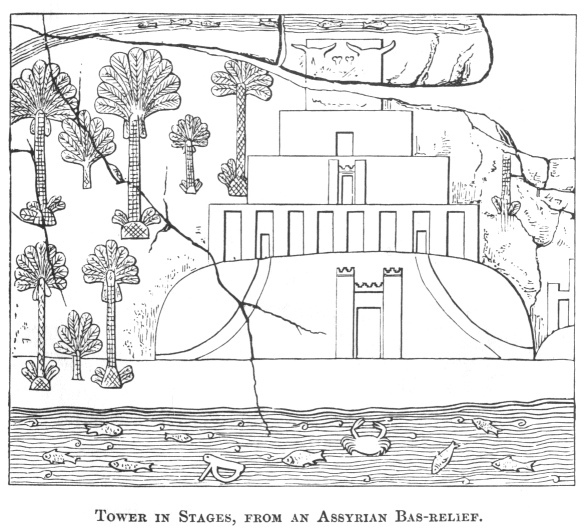 The only other ruin which has any claim to represent the tower is the Babil mound within the enclosure of Babylon, which is the site of the Temple of Bel. I have given views of both ruins as the possible alternative sites. which is supposed to represent the Tower of Babel. Birs Nimrud now consists of seven stages, but the top stages were only built by Nebuchadnezzar; before his time it probably presented the appearance shown in the Assyrian sculpture, and in the similar Babylonian representation figured opposite page 236 of "Assyrian Discoveries."